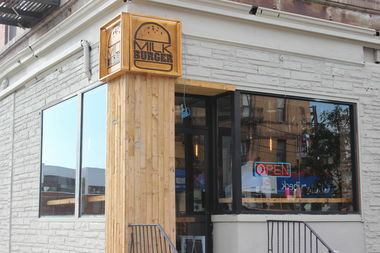 The Times listed Milk Burger as one of many reasons to visit the South Bronx this year. Last year was a big one for the South Bronx. Bernie Sanders and Hillary Clinton both stopped by. The area got its own Netflix show. And medical marijuana made its long-awaited debut in the borough. And even though 2017 is still just a few days old, it, too, is shaping up to be a big year for the neighborhood, as it has already received an honor shared by internationally renowned destinations like Aarhus, Denmark and North Dakota's Theodore Roosevelt National Park: a spot on the New York Times' annual list of places to visit throughout the year. The Times wrote that, although crime is still an issue in the borough, "things are turning around" and listed a slew of new local businesses that opened in 2016, including the Italian restaurant La Grata, the gourmet burger joint Milk Burger and multiple new coffee shops. Reactions to its inclusion on the list have been mixed so far, ranging from excitement to astonishment to concern about gentrification. Borough residents looking forward to the possible influx of tourists can continue to get excited, while those who would prefer that they stay away can encourage them to visit another spot on the list instead. Australia's Great Barrier Reef is nice this time of year.